I know, I know — there are cool canines all over the United States and across the globe, but there’s something quite unique about San Francisco dogs. Maybe it’s the vibe of the city itself or the sheer number of dog lovers and their pooches that reside there, but it’s true — the coolest dogs live in San Francisco! It’s hard to believe that it’s been over two years since my very first blog post, Keeping San Francisco Dog Friendly, which I wrote after visiting my son and daughter-in-law in the City by the Bay. I LOVE it when they send new SF pup pics my way, so I thought I would share these gems from Brandon and Colleen. This is my kind of store greeter! Could this little guy be heading home from a day at the office? You just gotta love this sweet face and smile! Here’s one cool, crusin’ canine! I’m pretty sure all of these works of art were adapted or created by street artist, fnnch. 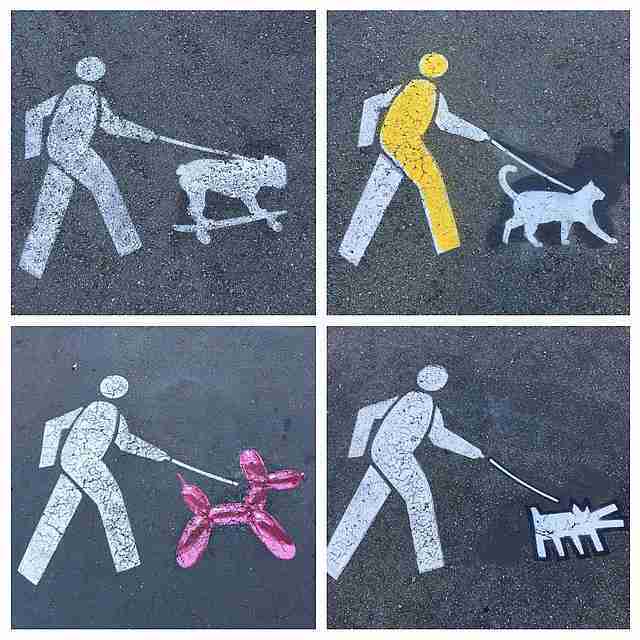 The original pavement signage had a lab-type dog to remind people to keep their dogs on a leash. The balloon dog is your favorite. Am I right? 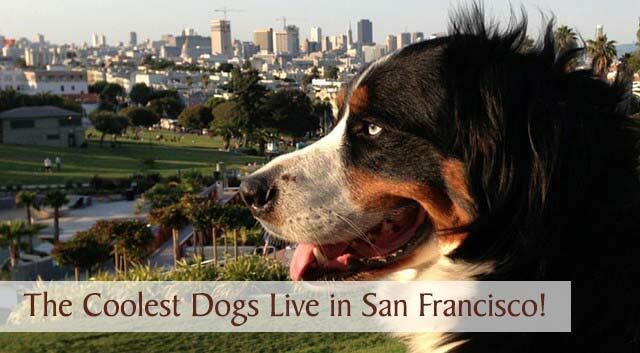 There’s no doubt about it, San Francisco people love their dogs! In case you missed the slideshow from my very first post (lets face it, everyone missed my very first post, lol), here you go. Enjoy! What do you think? 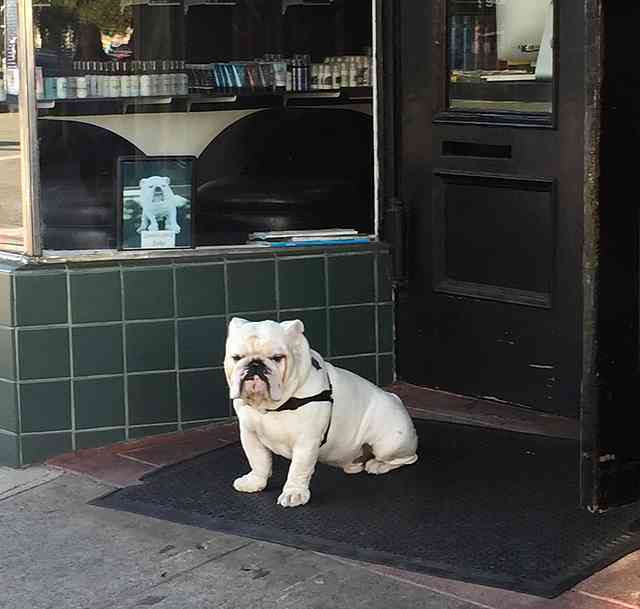 Are San Francisco dogs the coolest? Prove me wrong by uploading your pup’s hip pic in the comment section below and I’ll display it here. 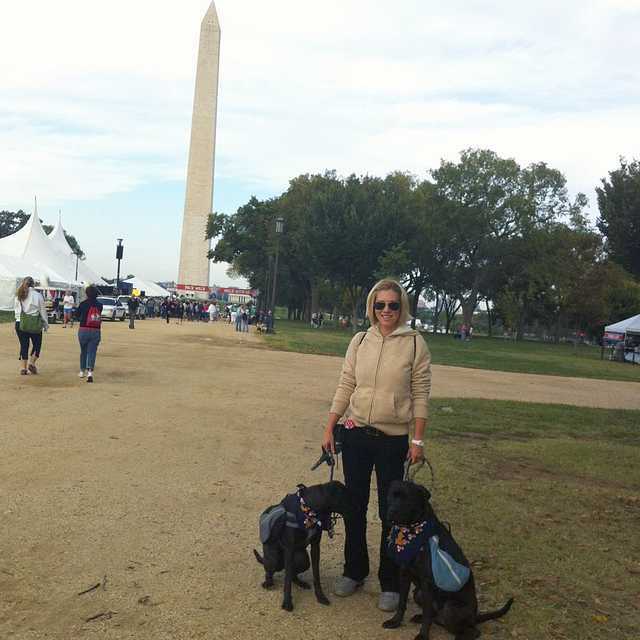 Barbara, Buzz and Missy from K9s Over Coffee – All looking cool in DC! I just took a travel quiz that said I should go to San Francisco next. The universe is telling me something! Oh, you should go, Kari! You’ll love the city and there’s so much to do just outside the city too if you like beautiful hikes or visiting wine country. 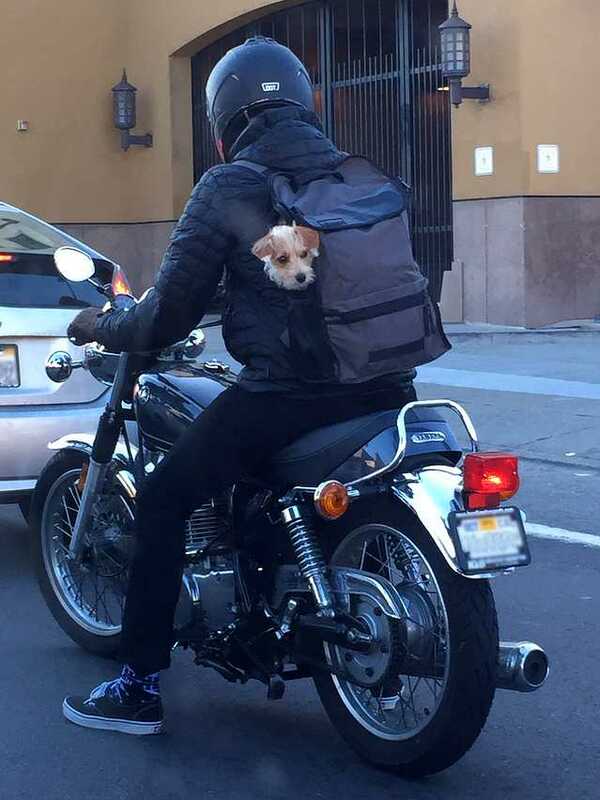 I would have to admit, the dogs in San Fransisco are savvy. Lovely pictures! Thanks so much, Michelle! ? I’m going to say San Fran may be the coolest city FOR dogs, but the coolest dogs are scattered around the world. Some fun photos you have there! I know for sure that there are cool dogs in Minnesota, Emma! ? Boy those pictures brought back fun memories of our visit to the City by the Bay. Have a cute pic of Chops but can’t figure out how to get to it. Sigh. Guess you’ll just have to take my word for how cute he is in his rain gear. I know, we can’t wait to go back and visit again! Email me the picture of Chops when you find it and I’ll post it here. He definitely is one cool dog! ? Hey no way! London dogs are just as cool 🙂 and If I knew how to share a picture then I would. London has one of the most diverse populations on the planet so following that we have a great range of breeds in the Capital. 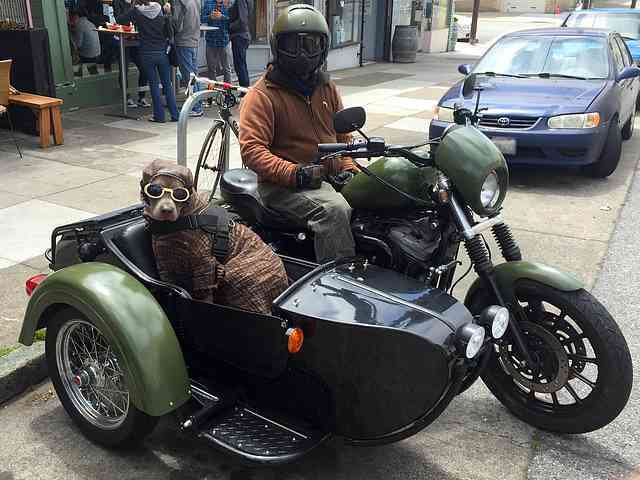 Love the dog on the motorbike. Send me a picture through email when you get a chance. I’d love to see some cool, London pups! ? 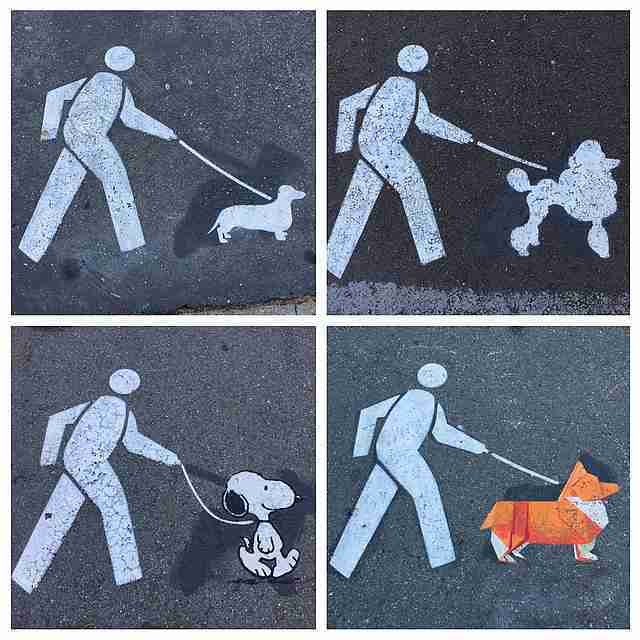 Love all the different San Francisco dog photos. I think I might have to do that for Chicago. That is pretty COOL! Thanks for sharing. Yes! That’s a fantastic idea. 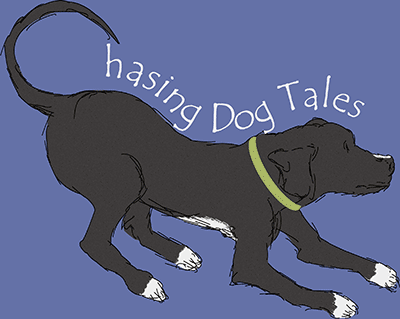 I can’t wait to see the canines of Chicago! ? I love these pics of the dogs on bikes/motorcycles! 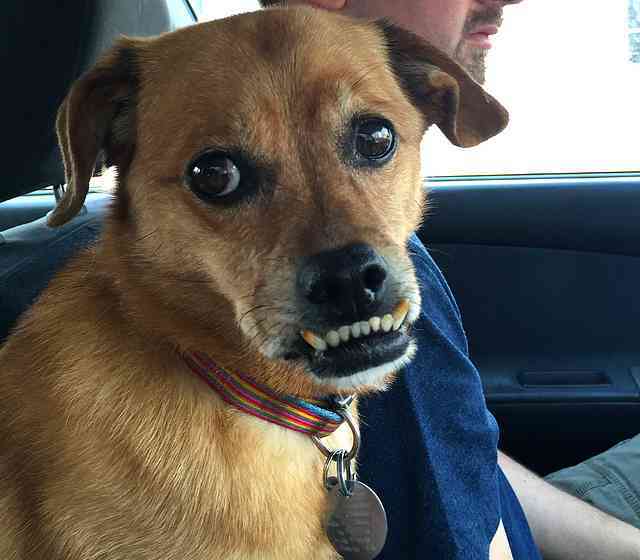 San Fran dogs may be cooler than Portland dogs based on these pics. What a great photo gallery. You should pitch a book based on this! I don’t know, Christine. I bet Portland has some awesome dogs! I’ll have to mention the book idea to my son and daugter-in-law. ?? 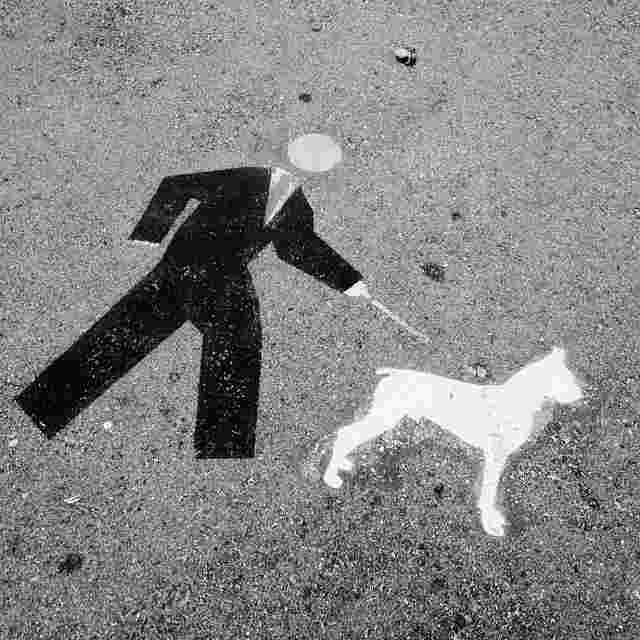 I love that street art! How clever and creative. Thanks for sharing it. There’s so much artistic talent in SF but sometimes the simple street art projects make me smile the most. ? I think there are a lot of cities I should visit in search of more cool dogs, haha! I’ve never been to San Diego but have always wanted to go. I’d really like to go back to D.C. sometime again too. So glad you had a fantastic time there and thanks for sharing the picture! ? I love the cool dog art! Perhaps one day I need to motor on over to San Francisco with the Boys and hang out for a few days. Yes, I think it’s time for both of us to start planning the Great American Roadtrip! Finally have some hubby-free time to spend catching up on my blog reading. Love all your photos! I do, however, have to agree with Emma…there are cool dogs all around the world. San Fran IS a cool city though! I wouldn’t want to be there during an earthquake, but otherwise I like the place. Yes, the idea of an earthquake in the city is pretty scary, especially if your dog started acting strange beforehand. Enjoy catching up with all your blogs and thanks so much for stopping by today! ?